I'm excited to finally talk about a new wonderful thing called ARTWALKS! ARTWALKS is focused on kids shoes based on kids books. They are launching with a line of 6 designs by 3 incredible kid lit artists. Jon Klassen, Joey Chou, and myself. Baby shoes for your babies and your friend’s babies! Your baby may have already read Hug Machine. 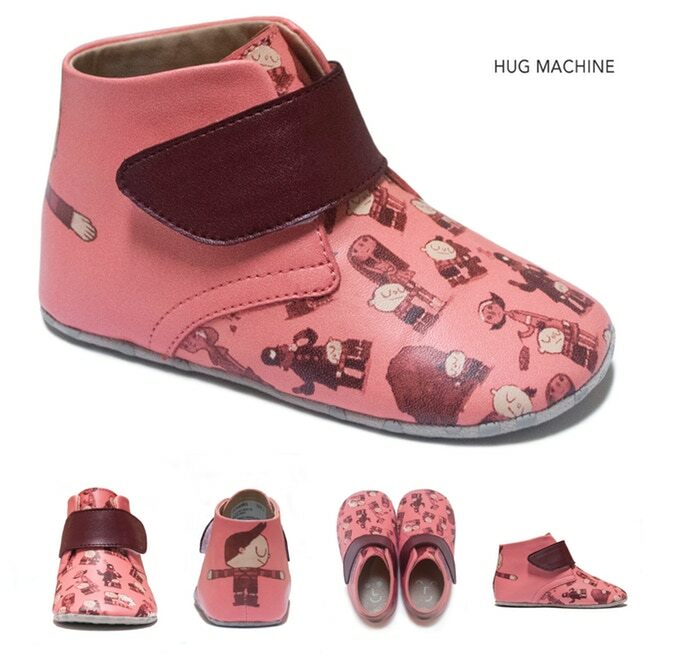 Now they can wear HUG MACHINE ON THEIR FEET! And also, Jon Klassen’s bear and hat! And Joey Chou’s unicorns! Your baby is going to FREAK OUT! Or your friend’s baby. There are even blank shoes for your baby to CUSTOMIZE! I know your baby has been asking about that. It’s a great thing they are doing. I am trying to get the word out to as many people as possible about this Kickstarter and would greatly appreciate any support you can provide. Whether it be backing the Kickstarter or simply sharing the campaign on social media. They’ve got all sweet rewards like original artwork, pins, and book combos. You’ll love it! Check it out and support it if you can! LOOK AT HOW PUMPED THESE BABIES ARE! They just meet up for picnics to read their books and wear their new shoes. Your baby should hang with these babies! GREAT SHOWDOWNS Print + Pin Release on Wednesday! It is GREAT SHOWDOWNS PRINTS time again! 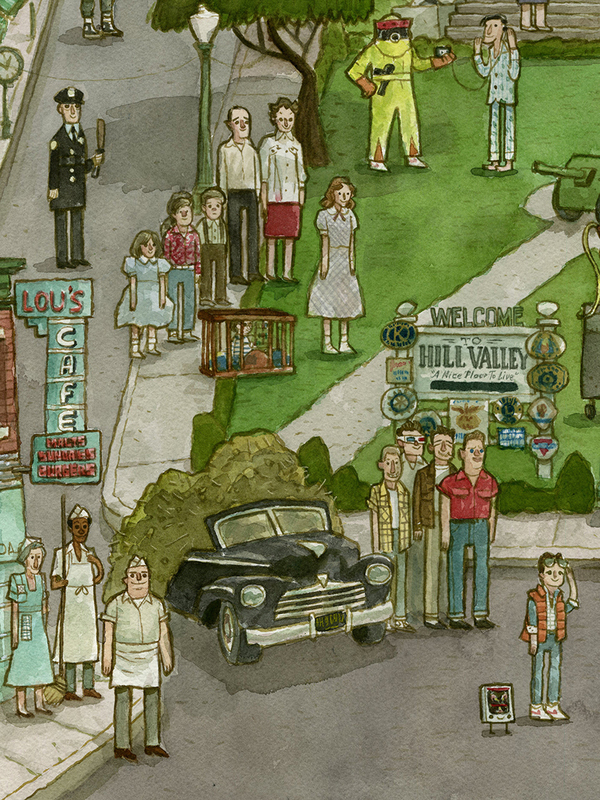 We’ve got 3 new Great Showdowns prints that will go on sale this Wednesday March 20th, in the Scott C Shop at 1 pm EST! This will be the usual timed release which means they will be on sale for just 24 hours. The edition size shall be determined by however many have sold in that 24 hour span of time. So prepare yourselves for “The Sloth And Friends”, “The Spiders”, and “The King” ! And in addition to these three pins will be a new pin called SLOTH PIN. It is a jolly fellow with a pirate hat, sword and an S on his shirt for Sloth probably. You will enjoy this pin! It will be $10. AND DON’T FORGET, we have a new THE SCOTT C SHOP Instagram and Twitter! Go follow those if you want specific updates on the goings on of the shop happenings and upcoming sales and whatnot! The Making Of "Clock Tower Valley"
This process post was first seen on Slashfilm last week, but here it is again in it’s entirety! Thank you, Slashfilm for all of the support! And thank you, Peter Sciretta for all your help with this piece. You can still pick it up in the Scott C Shop until this Wednesday March 30th along with those pins!! I began by watching Back to the Future for the 128th time, taking screenshots as I went. The film is so iconic that even the most insignificant moments have stayed with me. Background characters and seemingly throwaway moments are just as memorable as some of the main sequences. I wanted it all. I wanted to experience every last detail. Over the next few weeks, I spent time with these screenshots, this mountain of film references. 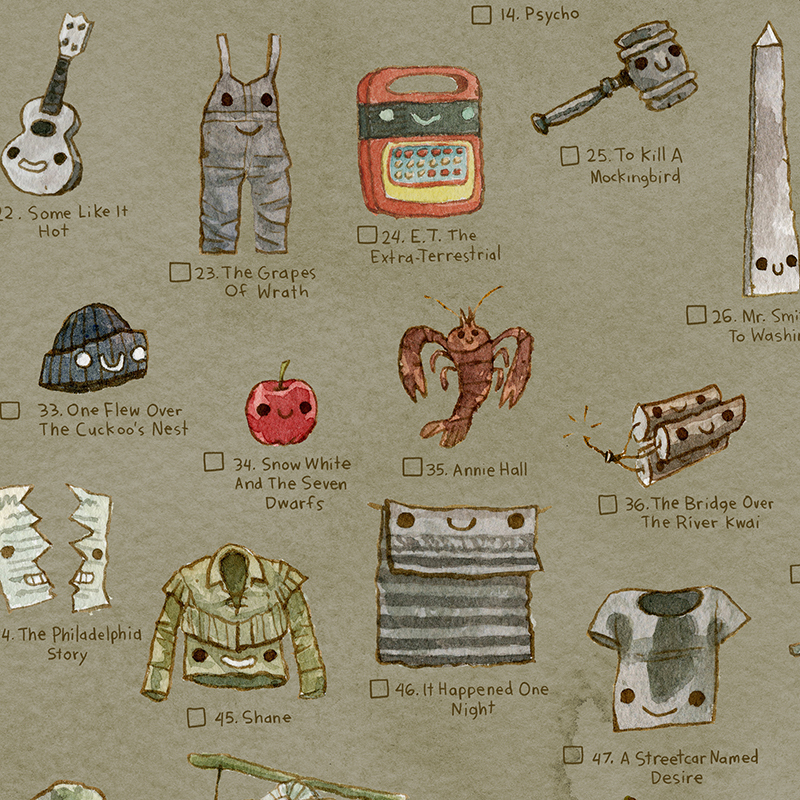 I began sketching these characters, objects, and spaces. I did not know exactly what the final drawing would contain, so it was better to just draw everything and trim it down later. I did thumbnails of what the scene might look like as a whole. I knew that the clock tower and plaza should be the main special element and that everything else should just live around it, so I sketched some thumbnails of that. I gathered all of these drawings and scanned them into the computer to compute the heck out of this thing. I cut all of the little elements out of the drawings and began to assemble them in photoshop. 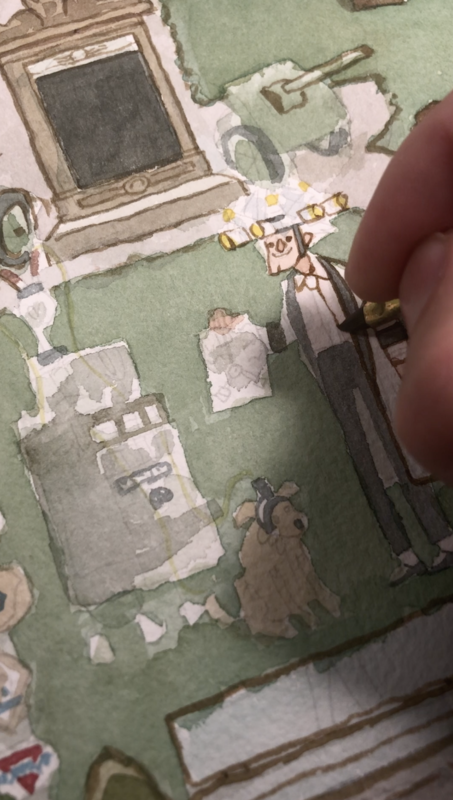 I started by enlarging the thumbnail of the entire space and just laying all the cutout characters and elements into the drawing like a puzzle. This is when I decided what things would make the final drawing and what things would be cut. I arranged and rearranged until the scene felt just right. It was at this point that I reached out to my good friend Peter Sciretta over at /Film for his advice on the drawing. I knew that this was his absolute favorite film and wanted to put that knowledge to good use. He suggested adding a few elements, like the photograph of Marty and his siblings. It was difficult figuring out how to incorporate that photograph into the drawing since it was such a tiny little thing, but we both agreed that people would enjoy seeing it. I ultimately solved the problem by just putting some eyes and legs and a little smiling mouth on the photo, like I always do. It really had it be its own character. I did the same with Little Flux. I like bringing objects to life in paintings, so they can hang with everyone. Once the overall drawing was as final as it was going to be, it was time to print it out so I could trace it onto watercolor paper to be painted. However, the drawing was still fairly rough at this point. Likeness is sometimes a finicky little beast. If I feel like I have nailed the likeness of a character too early in the process, I become fearful that I will fail with the likeness in the final piece. It’s just an inner battle I always have with myself. My printer only prints on 8.5″ x 11″ sheets of paper and this was a big painting. So I needed to tape the pieces together to make it nice and big. I brought the taped-together Frankenstein paper over to my light table to trace the drawing ever so lightly onto my big piece of watercolor paper. I used a 4H pencil to ensure that the drawing remained light. Too heavy of a graphite line would muddy up the paints later on. Once the drawing was there on the paper in all its faint splendor, it was time to figure out the color scheme. In a painting with so much going on, it is a good idea to simplify the color scheme as much as you can. 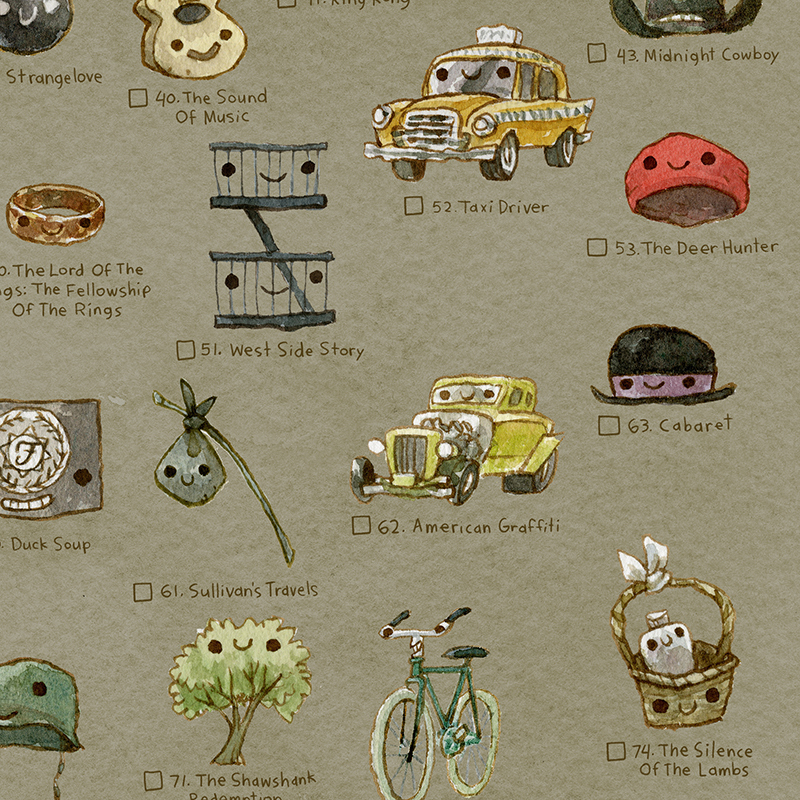 I selected a few basic colors as a road map to stick to for the background elements. I painted little squares of color that professional artists call swatches. Feel free to call them swatches even if you are not a PROFESSIONAL. You can live your life how you like! It was time to really get started. I began by laying in the big areas of color. I like to do this first – it feels like I have accomplished big things right up front, getting an overall feeling for how things will look. Initial colors often take the longest to get in there because decisions need to get made. Luckily, the color schemes of the outfits have already been chosen by the costume designers on this film, so I just looked at my reference. I gave myself a bit of a break on this and just plugged everything loosely in there. It always looks like a real mess at this stage, but that is how it goes. We will save it later with lines! Once the basic colors were all blocked in, it was time to mix the big batch of dark reddish brown for the linework. 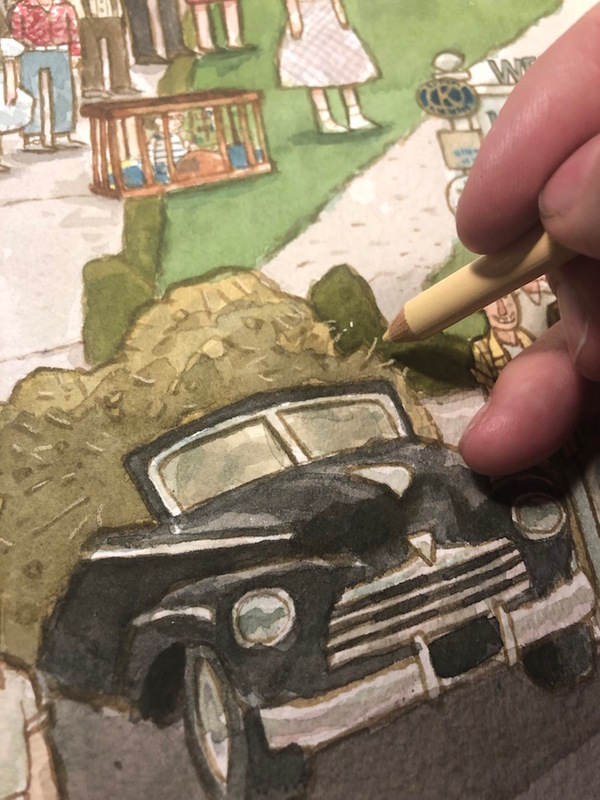 I put some burnt sienna in there, yellow ochre, olive green, vermillion green, some blue…heck I put almost every single color in there. My favorite time! Linework time! This was when those blobs of color that vaguely look like characters and buildings began to take shape. But this was also a rather stressful time because this was when the likeness of the characters either hit and miss. Some of the likenesses felt like successes while others felt a bit like misses. But you can’t win them all. If any of the likenesses were just too overwhelmingly bad on a character, I just got my paper towel wet and wiped that part out and started over. 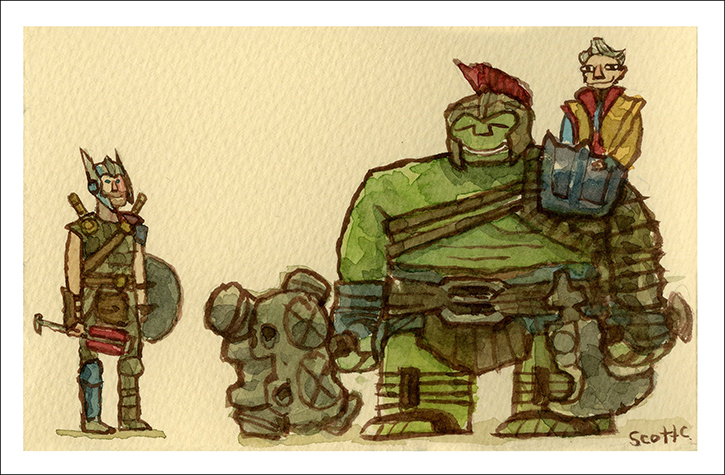 Watercolor is quite forgiving in that way. If you don’t like what you painted, just wipe it out and do it again! I definitely did that in this painting here. Especially with Marty’s face. His face was tough to get right. Once all the linework was in there, it was time to relax! I just needed to punch up all of the values. The colors were all quite faint at this point, with limited value contrast. I like to push the darks as much as I can, varying the levels of the mid tones. I like to listen to podcasts at this point in a painting because my brain can finally enjoy things again. I listened to a lot of Comedy Bang Bang and Unspooled during the course of this painting. In the early stages, where I had to use my brain for drawing and composing, I listened to lot’s of good old EDM. That stuff is like a little repetitive brain massage. This thing was almost done at this point, but the time came to go back and heft up some of the outlines on these characters to help them pop. This is a little cartooning trick, you guys. Make the lines on the inside fainter and thinner than the lines on the outside. Sets that character right in there on top of the background. Some parts of the painting needed some light colored lines. I brought in my colored pencils for the rocks and pebbles, stripes on shirts and dresses, and bits of hay in that pile of manure. At some point, you need to call that painting “DONE.” I could probably work on a painting indefinitely, but I do not have infinite hours to work on a piece. I just need to call it DONE, so I can walk away and get some fresh air and shift focus onto new projects. So I called this thing DONE! I now present it to the masses! And that is how the story goes. I hope everyone enjoyed this little journey through “Clock Tower Valley”. This was a piece I have wanted to paint for a long time and it felt good to revisit the movie that helped shape my world so much. And don’t forget to grab a print of this before Wednesday, March 13th in The ScottC Shop! Once the sale ends, the prints will be gone forever! "Clock Tower Valley" - Print and Pin release! Let us gaze upon “Clock Tower Valley”, inspired by one of my absolute favorite films of all time. Arguably one of the greatest films of all time. Thank you to my friend Peter Sciretta from Slashfilm for his advice on all of the minute details. This is Peter’s favorite film of all time, so he knows what he is talking about, you guys. I loved making this thing so much. I would like to live in there amongst everyone and just stroll around. We will be releasing timed edition prints of this thing starting this Wednesday, February 27th at 1pm EST lasting until March 13 that 1pm EST. Once the sale ends the print will no longer be available. The edition size shall be determined by however many have sold in that 2 week span of time. Also, available on Wednesday will be these 4 pins! The Traveller, The Doctor, The Little Flux, and The Machine. 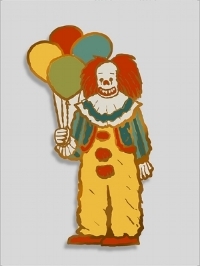 Each pin will be $10 each! A pack of all 4 pins will be $35. Have you seen Umbrella Academy yet? Well, it is wonderful. It is a new super hero show on Netflix based on a comic by the same name illustrated by my good friend Gabriel Ba and written by Gerard Way. It is a unique take on the super hero genre that i find quite refreshing. Ellen Page is just amazing in it, as is Robert Sheehan who plays the wild character called Klaus who can talk to ghosts. It is beautifully designed and you will probably love it. 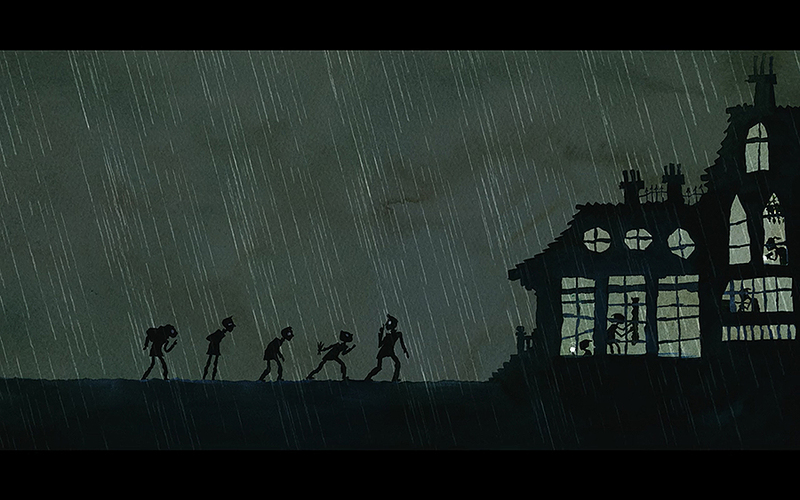 I was honored to be asked to design a little animated segment in the episode 8 where a character is telling a children’s story about the Umbrella Academy heroes. 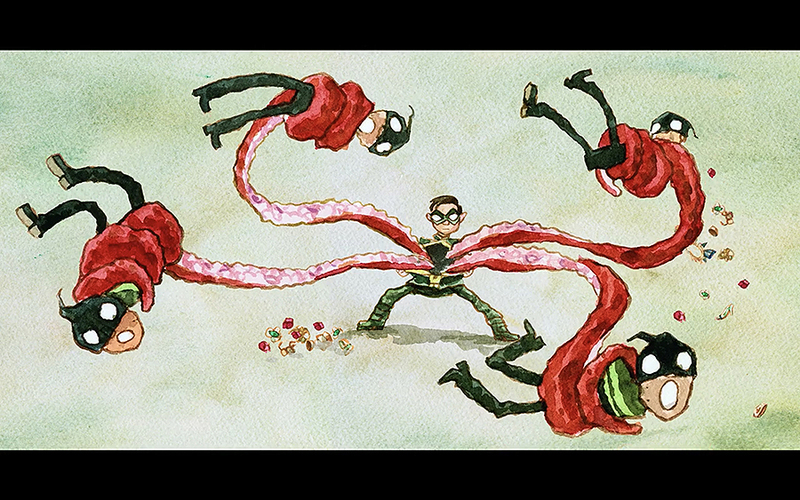 I painted 7 spreads split into parts to be animated by the marvelous gang at Pip Animation Studios in Toronto. I was happy with how it turned out! 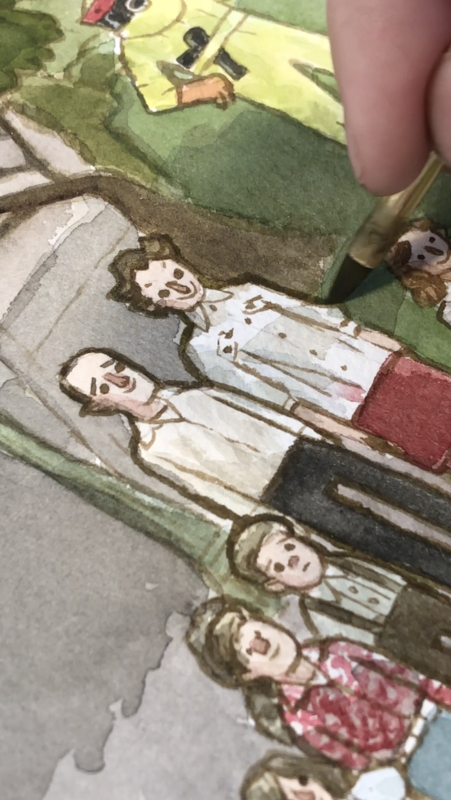 This is the first time I have seen my watercolors move like this and it is fun to see. It has tipped my interest into the world of moving pictures. I would like to do more things like this. I am going to post the 7 shots below, so if you do not want spoilers, DO NOT SCROLL DOWN. I mean, it doesn’t really spoil anything in the show. You will just see what I did for it. So if you want to be surprised go watch the show! Thank you to Jeff King and Steve Blackman who were so great through all of this process. I had a great time with this project. GREAT SHOWDOWNS Print Release on Wednesday! 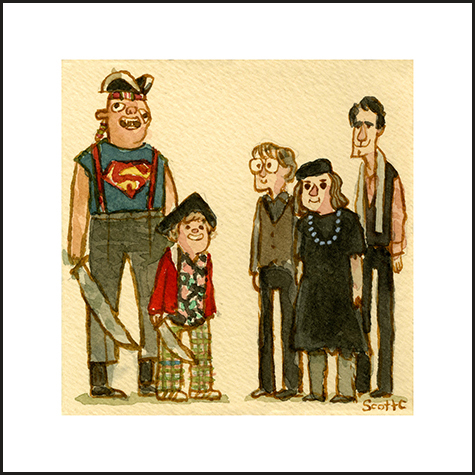 It is time for some more GREAT SHOWDOWNS PRINTS! We’ve got 3 Great Showdowns prints that will go on sale tomorrow, Wednesday February 20th, in the Scott C Shop at 1 pm EST! This will be the usual timed release which means they will be on sale for just 24 hours. The edition size shall be determined by however many have sold in that 24 hour span of time. So prepare yourselves for “The Bear”, “The Rescue”, and “The Black Knight” ! BUT ALSO, prepare yourselves for a SECRET SHOWDOWN that shall sneak it’s way into 20 random orders. That Secret Showdown is called “THE BEES”. So be on the lookout for those BEES in your orders! IN OTHER NEWS, we have a new THE SCOTT C SHOP Instagram and Twitter! Go follow those if you want specific updates on the goings on of the shop happenings and upcoming sales and whatnot! “THE BEES” - Not For Sale…. Hidden in 20 random orders! SCOTT C HOLIDAY GIFT GUIDE! I have compiled this list for you. All of these things you will be able to get online at TheScottCShop.com. This is a very special item. These are one of a kind jammers. They will go on sale tomorrow Dec. 6th at 12noon EST. Igloo Head and Tree Head debuted in Flight Comics #4 in 2006 with this story about a world of creatures with things living on their heads like trees, igloos, and park benches. It is a tale of two buddies trying to make mountains out of molehills. In 2007, it received a silver medal in Sequential Art from the Society of Illustrators. These were the framed prints that hung in the Society of Illustrators: Book and Editorial exhibition in 2007. They have lived in storage for awhile, but would very much like to move into your house and live on your walls with you! 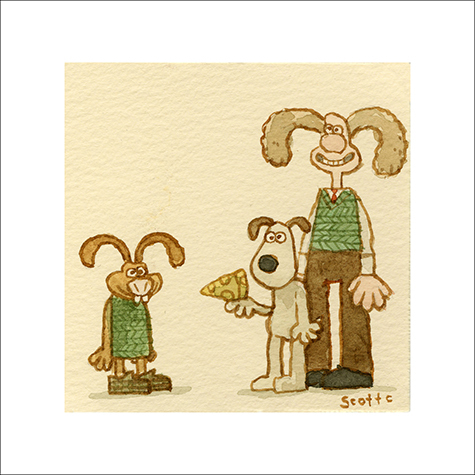 The newest and greatest collection of SCOTT C. ART. You can read it anywhere you want! Keep it anywhere you want! Keep it a secret! Make a public show of it! LIVE YOUR LIFE! Your loved one will be so happy to have this thing. Is your loved one creative? Do they want to be? Do you want them to be? Well, this book will ignite those dormant creative energies. This will be your very own sketchbook that you can carry around with you wherever you go with prompts and suggestions by me on what to draw! It will be like we are hanging out and brainstorming together! The book explores the techniques I use to brainstorm ideas and just loosen up my brains. It will be really fun for us to explore and create this world together. We will draw unicorns, knights, mummies, dragons, weird inventions, fancy hats and shoes, food, things that live in caves, things that live in stomachs, things that float in space, we will draw some candy, some pets, and even some GHOSTS!! It will be an incredible time to be sure. Perhaps your loved ones just want to brainstorm in their own ways? These journals are filled with blank pages for you to be creative within, but they are sandwiched between some Scott C paintings there on the inside and outside covers. It will be like we are out drawing together when you take these on trips! You could probably fit these in stockings i’ll bet. Or in pockets. Do you like writing to your loved ones? 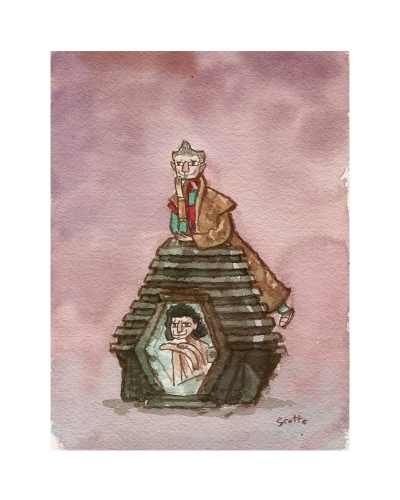 This box contains 20 greeting cards with various pleasant depictions of friends enjoying themselves. Perfect for sending to friends and family to express caring. Write whatever you want in there! Do your loved ones have trouble getting to sleep? Do they constantly make excuses in order to stay up longer? Well, this book should help. It is a children’s picture book about a boy named Roderick who has a difficult time getting to sleep, but with the help of his new stuffy Sleepy The Goodnight Buddy, he will surely get to sleep. But maybe not in the way he expects. This book is great for all ages, but mostly children ages 4 - 7. These little pins will look nice on your jackets, backpacks, corkboards, drapes, capes, and all those other pinnable things. Choose from "Chubby Bunny", "Frog Banjo", "Rocket Dog", "Grems", “Red Dress”, and even “The Clown”. So many pins, you guys. Go crazy. And what about things to go on your WALLS?? Does your loved one enjoy the WILD WEST? Check out these sharp shooting sheriffs taking the law and judgements into their own hands. Will look great in your loved one’s DEN or in the living room above the mantle. Is your loved one into spooks? How about little sharp toothed vampires? This frightened little guy will go great in that spooky room. Everyone loves the GRANDMASTER. And everyone loves technology, right? Put those two things together and you get this little print. The perfect print for the LABORATORY. What about SPORTS? Does your loved one like sports? Look no further. This little bite size print is for them. A GREAT SHOWDOWN from a very popular sports film about cartoons jamming with an actual NBA player. Your loved ones certainly need shirts for their bodies and bags for their stuff right?? Volcano Cloud T-shirts and Totes! We've got shirts with volcanoes and dinosaurs on them! Can you believe it?? Heck, we put that volcano on a TOTE BAG. You can put whatever you want in this bag. Alright, that is all for this year’s HOLIDAY GIFT GUIDE. Feel free to peruse theScottCShop.com for other gifts. There are all kinds of things in there. Anyway, i am so happy to have been asked to do this because i love UNSPOOLED and i love those two people. Please enjoy!